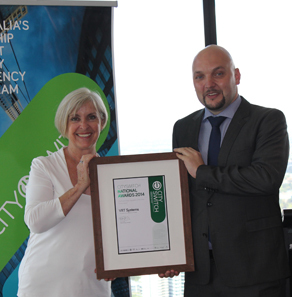 CETA is delighted that one of their Systems Integrators, VRT Systems, has just beeen announced as the winner of the City Switch Queensland New Signatory of the Year Award for 2014. CET meters are used to collect data on electricity and water usage and VRT engineers integrated the collected data into their WAGES Hub (Water Air Gas Electricity Steam) software. The data is shown in real time, and displayed graphically on a 3D visual display on a screen in the foyer of the building by utilising VRT Visual Workplace technology. The data is also connected to the Switch Hub, giving remote visibility and control to the facilities manager. For instance if the air conditioning is left on, it can be turned off remotely. A shift to good data monitoring and displays were behind VRT Systems’ energy savings results. The organisation's success stemmed from real time displays coupled with staff awareness campaigns. The monitoring showed how simple measures like removing lights, reducing use of other lights and air conditioning can yield real results. Measures implemented by the organisation reduced electricity usage and greenhouse emissions achieved an annualised 12% reduction in energy use. Congratulations VRT staff for their commitment to reducing greenhouse gas emissions.